Military Commercialism in Zimbabwe - A Blessing Or Curse? President Emmerson Mnangagwa has retired four top military generals who served under former President Robert Mugabe and were once direct subordinates to then defence forces commander and now Vice President Constantino Chiwenga. In a Monday statement, Chief Secretary to the President and Cabinet Misheck Sibanda said Major Generals Martin Chedondo, Douglas Nyikayaramba, Anselem Sanyatwe and Air Vice Marshal Shebba Shumbayaonda had been retired and reassigned to diplomatic missions. "The Chief Secretary to the President and Cabinet Dr D J M Sibanda, today announced the decision by His Excellency the President Emmerson Mnangagwa to retire and reassign senior military officers to diplomatic service in line with government's critical global engagement and re-engagement strategy," said Sibanda. The four's accreditation credentials will be announced in due course, according to the statement. The re-deployments could be viewed as an attempt by Mnangagwa to further dismantle his ailing deputy's crumbling military base while consolidating his own hold on power. Even outside military service, Chiwenga is seen as still having influence within a security system that ousted Mugabe November 2017. Since taking over, Mnangagwa has painstakingly gone about untangling the country's security structure built over decades by Mugabe to become heavily involved in partisan politics both within and outside Zanu PF. Sanyatwe, was commander of the crack Presidential Guard at the time of the coup and is believed to be one of Chiwenga's key allies with great influence within the military's rank and file. Mnangagwa last December promoted, Sanyatwe the man who commanded the military unit that reportedly shot at unarmed protesters, killing at least six civilians on August 1 last year, as post-election violence rocked Harare. Insiders say Sanyatwe has since been replaced by one Brigadier Mhonda, formerly Commander 2 Brigade. Mnangagwa has already made key changes within the Air Force of Zimbabwe where Air Marshall Elson Moyo took over from the now Agriculture Minister Perrance Shiri after the coup. General Philip Valerio Sibanda is now Commander Defence Forces, Lieutenant General Edzai Chimonyo was recalled from diplomatic service to take charge of the army, Isaac Moyo was brought back from South Africa where he was Zimbabwe's envoy to take over as Central Intelligence Organisation chief. 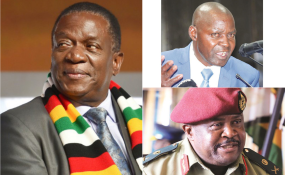 Sibanda, Chimonyo, Elson Moyo and Isaac Moyo all hail from Mnangagwa's home province of the Midlands and are believed to be closely related to the President. In November last year, Mnangagwa also retired Police Deputy Commissioner Generals Innocent Matibiri, Josephine Shambare and Levi Sibanda who were reportedly linked to Mugabe. Sources said current Deputy Commissioner General Stephen Mutamba who was subsequently elevated from being a Senior Assistant Commissioner is tipped to take over charge of the police from current boss Godwin Matanga.